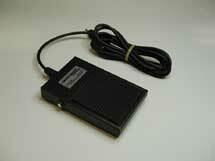 At last a quality Foot PTT Switch you can rely on. This rugged industrial grade all metal PTT Foot Switch is just what you've been looking for for that DX or Contest or Net Control Station. This rugged item is truely intended for industrial manufacturing floor use and the construction is there to support this sort of heavy-duty use. I call it the "SuperDuty*" of Foot Switches. Powder coated finish, rubber non-slip pedal and foam rubber cushion on the botton to prevent wandering under your operating position. A re-invention of PTT interfaces has come about, so the once popular PTT interface of the 1950s, '60s and '70s on everything from Collins S-Line to Heathkit SB-Line radios has made a come-back. Many manufactures have selected this as a popular PTT interface on modern gear from Elecraft, Flex Radio, Ten-Tec and late model Yaesu gear. Select this for your radiosport RS60CF boom-mic Headset. For radios built with a PTT interface on a rear panel 5, 7 or 13-Pin DIN accessory connector we offer special adapters to our radiosport Foot & Handheld PTT Switches. The ICOM 13-Pin DIN adapter supports two separate HF/6M and VHF/UHF PTT interfaces. See some of these applications on the lower right of this page. Many of the new small HF/VHF/UHF mobile/portable radios do not have sufficient rear panel space for external PTT interfaces. We are developing a new Headset-To-Radio cable assembly that includes a Hand Operated PTT and a jack to accept our standard Foot Operated PTT Switch. Watch our "New Products" Page for announcements. PTT Assemblies and cables ship by USPS Priority Mail for fast delivery. US $26.85 insured shipping to Canada and Mexico. US $37.70 insured shipping to approved international destinations. Quality Foot PTT with a 7 foot fiber reinforced cable and RCA Phono Plug. The renewed standard RCA Phono Jack rear panel interface. PPT-HS-RCA - Quality Handheld PTT with a 7 foot fiber reinforced cable and RCA Phono Plug. The renewed standard RCA Phono Jack rear panel interface. Momentary and Push-On/Push-Off PTT Buttons. Velcro Mount for Desktop use included. NEW! 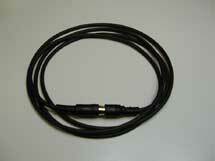 5 Foot Extension cable for External PTT Switches - remote or rack mount installations.